Where is the input jack? I only see the 8 output jacks? Thank you! BEST ANSWER: All switches today use any of the ports as an input. It auto senses which one and all the others become outputs. That is why it says it supports "seven downstream computers". They are bidirectional so all ports send and receive. Super simple just plug all jacks in and as long as one is the host you are good to go. There is not really such a thing as an input jack on a switch. the switch acts to allow communication between any devices on any connected ports. Any if the 8 ports can be the input. Given that this is a switch, I just plugged into a port (paid no attention to its location) -- Happens that I used "LAN6" to attach to my Gateway/Firewall system. Note, my system does multi-wan, so I have two ISPs feeding my Gateway/Firewall. Everything else in my LAN ultimately connects off this initial 8 port switch. I am having NO problems internally. Because it is a switch, all ports are inputs and outputs. All it really does is sync to the input and amplify and create more outputs. The other nice thing is that it can accept transmit or receive cables. There is no input. With a network switch, all 8 ports are peer-to-peer. A router would have an input jack and be able to assign IP addresses to connected devices. Here's what we are trying to do. We have a wireless router connected to a cable modem. It has four RJ45 ports. We need more ports. If connect this switch to one of the outputs of my wireless router can I use the other 7 ports on the switch to provide internet access to other devices? 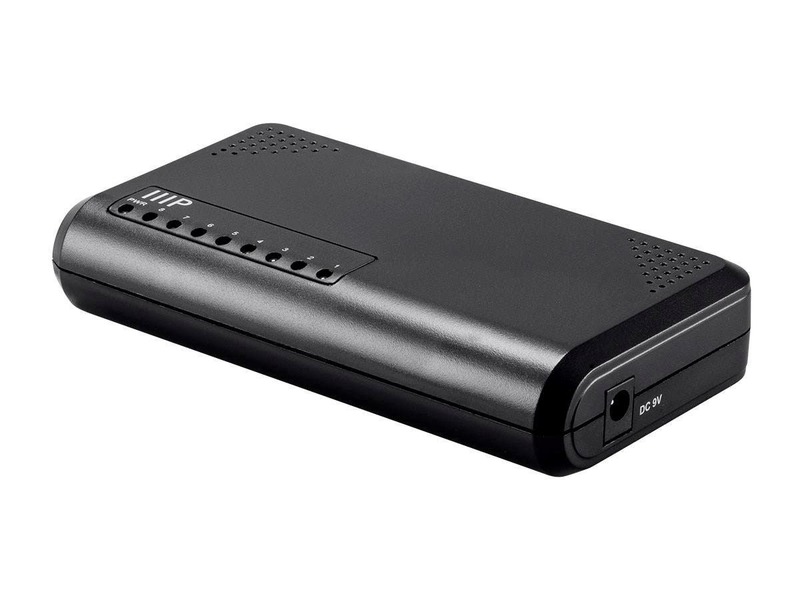 use the other 7 ports on the switch to provide internet access to other devices?" The answer is Yes, that is exactly what a switch is used for. Any one of the 8 can be the input jack as this is a just a Ethernet switch to provide more ports for your local area network (LAN). On a simple switch such as this, all ports are equally inputs and outputs. It may be that you looking for a router? Can you connect two of these together? BEST ANSWER: Yes. All you have to do is connect one of the ports from one switch to one of the ports of the other one. Since it is an unmanaged switch, there are no designated uplink ports. I have not try connecting two of the same type together. But I have it connected from a modem then connected this to another 5-port switch and have no issue. Yes You can run a line from one yo the other. You will only have15 outputs then. Yes. I actually have three of them connected together in different rooms. Yes, they are unmanaged and you can add as many as you want. Yes since they are unmanaged and bidirectonal. Great. Will be ordering another one very soon. Thanks Curtis. I have 5 in a chain they work well. What ethernet cables do I need with this switch to connect to TV's and Computers? They will be run through walls. 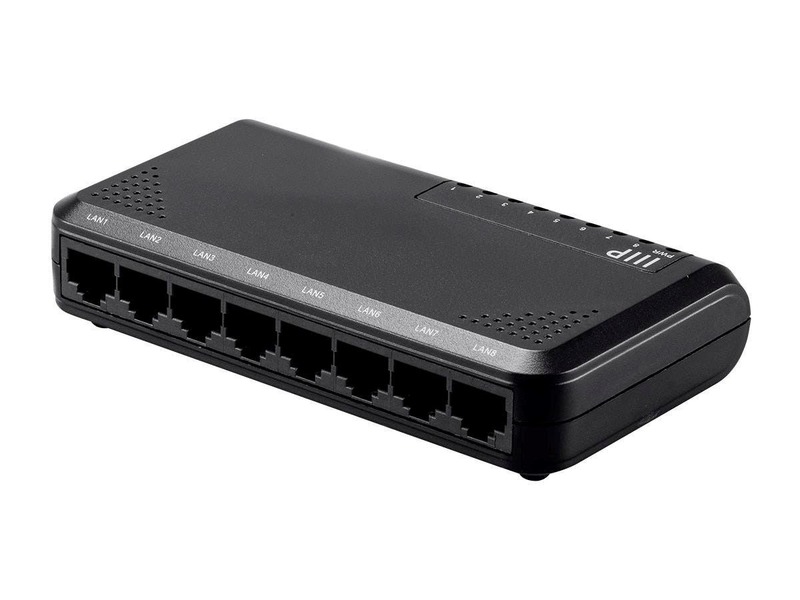 BEST ANSWER: Normal Cat5 or Cat6 cabling with RJ-45 connectors are used, like any other consumer network switch.. I have my entire house wired with Cat6 and punchdown jacks in wall outlets and use a few small switches like this when I want to fan a single jack within a room. sorry about that .clicked on wrong button. my bad verr y informative awnser to the question. I got so cought up in this well explained awnserer to a good question. ROCK ON. Use the ones that are approved for in wall installation that have the fire resistant wire protection. Read the description that Monoprice gives and it will say approved for in wall installation. Standard 8 connector straight through cat 5 or cat 6 cables. The cat rating depends on the speed you will be running and the cable length. RJ-45 connectors. Cat5 or Cat6 should work. I would go with Cat6. Straight through (although the switch is autosensing, so crossover should work, as well). 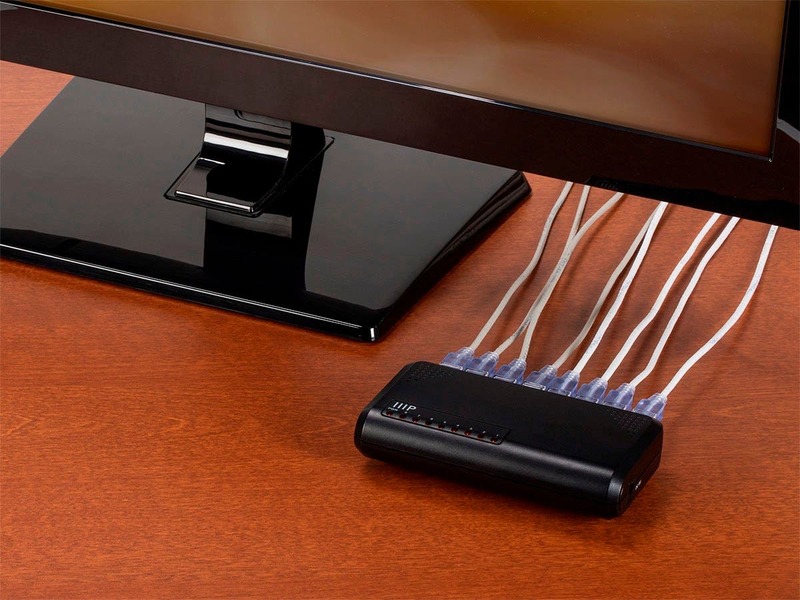 any standard cat5e or cat 6 cable will work to the computer or to the tv if it has a Ethernet connection. Any standard ones will work. I ran just normal off-the-shelf Cat 5 cable from Staples or Monoprice. Regular CAT 5, 6, or 7 will do fine! How much power does it use? How hot does it get? Is there a fan? Noise? BEST ANSWER: This device would only use about 5 watt hours of power. Operating temp would be between +32 ~ +104°F. There would be no fan and therefore no noise. I can't answer the power consumption, I don't have the tools. It is silent, there are no fans. I have mine in a drawer in my desk along with the router and modem and it does get decently warm but not to concerning levels in my opinion. I'm pretty sure it would be even cooler if it wasn't in a small drawer. This is one of the best switches I have purchased and I work in IT. It's small, convenient and I don't think you will regret getting it. I will be picking up more in the future for other projects. Really not sure of the power consumption but it is only a 9 volt feed so it should not be bad. As for the noise there is none and no fan. It is only slightly warm to the touch. Not certain, but it can't use much power. Cool to the touch. No fans needed and no sound at all. No noise (no fan), little heat. The picture showing it "in use" doesn't show the power cable plugged in. Is the power cable optional? The power cable is required during operation. BEST ANSWER: A switch can become blocking if its backplane can't support the full bandwidth of all its ports simultaneously. The specification section on the product page indicates the backplane bandwidth is 2x the number of ports on the switch. That means it can support every port both sending and receiving 1Gbps, simultaneously. By definition, that makes this switch non-blocking. I do not know, exactly, what you mean by blocking. I think you are referring to Hubs, which can only handle traffic between 2 ports at a time. This switch handles traffic between multiple ports at a time. Not only do I have multiple streaming devices, but I have multiple devices connected by wire and I do not see "collision" problems. According to my Gateway/Firewall, I have different devices getting > 100Mbs from my ISP, and I'm supposedly limited to 100Mbs. BEST ANSWER: Since it comes with it's own power supply, I see no need to use a higher voltage power supply. I would think it's not a very good idea unless you want to create a blue smoke generator. I would say ...use the properly furnished Wall Wart that comes with it. In my experience, using 12 volts on a 9 volt unit will burn it up! It comes with its own power supply in the box. Energy star rated? What is power usage? 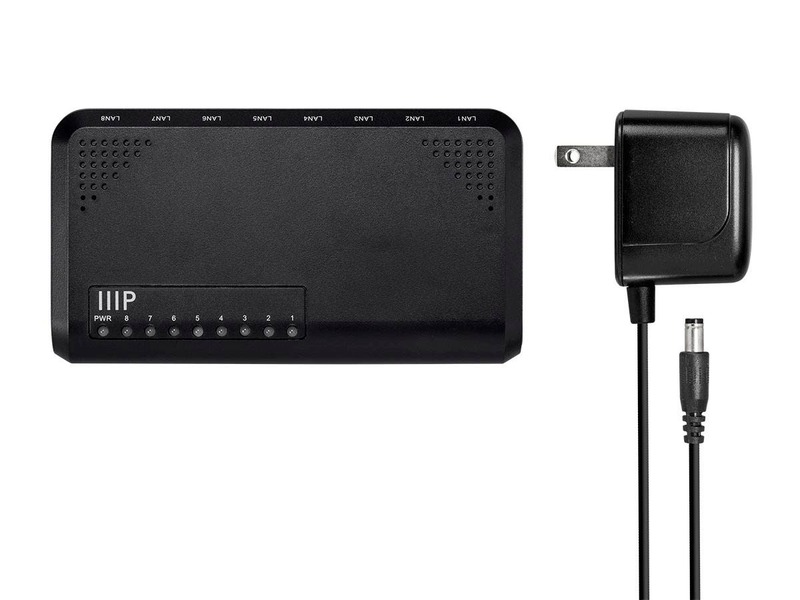 BEST ANSWER: It comes with a 110v AC plug in power adapter that says it is rated at 9V DC @ 500mA. It looks fairly standard. Thanks, but that doesn't indicate Energy Star rating. It just means that the MAXIMUM power usage of the device could be 9 x 0.5 watts. But the maximum wall power would then be 4.5 W/(efficiency of the 110V adapter), likely upwards of 6 watts. I would expect its average wall power to be 2-4 watts though. It would be nice to have this specification in the product description. Hi Terry, I'm sorry, bifocal problem. No, obviously it does not state that it is Energy Star anything. I never care about that anyway, as long as it works and works well that's all I care about. I have at least ten boxes (four Linux and various flavors of Windows) running 24/7 so saving $0.25 a year on a powering up a switch never worries me. Again, I'm sorry, all I saw was "What is power usage?" At $15 you can't go wrong in any event. It comes with a 110v AC plug in power adapter that says it is rated at 9V DC @ 500mA. It looks fairly standard. Ok, so I'm having issues after just receiving and connecting this today. I had a 5 port tp link switch before, but wanted all my devices on the same ip address set, so I removed 3 devices from my modem and basically just swapped the two switches. When I connect the lan cable from router to switch, I have nothing at all, wired or wireless. I remove that cable and all is fine. I have super fast internet and a quality router (ASUS RT-AC3200). The only difference is the switching out of the two switches. Did I receive a lemon, or what could be the issue? Asus tech support couldn't help me. BEST ANSWER: This is an unmanaged switch. This means it will forward traffic by MAC address and is not aware of IP addresses. One of the other 3 devices you removed must have been providing your devices with an IP address - a router, not a switch. From your description your Asus router does not have DHCP (IP address assignment) turned on. Either connect the router that had DHCP back to the network, or turn on DHCP on router. Your question is not exactly clear, it sounds like your devices are not being assigned an IP address so I based the answer on this. Can this switch be used to provide Ethernet connectivity if the input is from an Ethernet over poweline system or does it have to come directly from a router? I'd like to locate this item on the first level of my home and have a few devices plugged into it (Philip HUE, Yamaha Ethernet Adapter, Apple TV). Can someone post the size (dimensions)? I don't see them listed. Does this switch have EEE (Energy Efficient Ethernet)? Can someone give me the dimensions on this? This is about the only unit I've found that fits in my wiring panel just right. I can stand it on its front edge, cables connect on top, can still see the LED's and the power inlet is on the side. There are only orange flashing lights on the front for connectivity. I wish they were multicolor leds to show different connection speeds. They work just fine, no problems, just plug-and-play! It was a direct cable swap-over from my old 5 port unit. Back in business! Does the job at a great price! Bought this for my son so he could spit the ethernet in his dorm room to the tv and his desktop. Works like a charm. I have a lot of these. My only (minor) objection is the lights are VERY bright orange and do not indicate the link speed. Works great and fast through put!